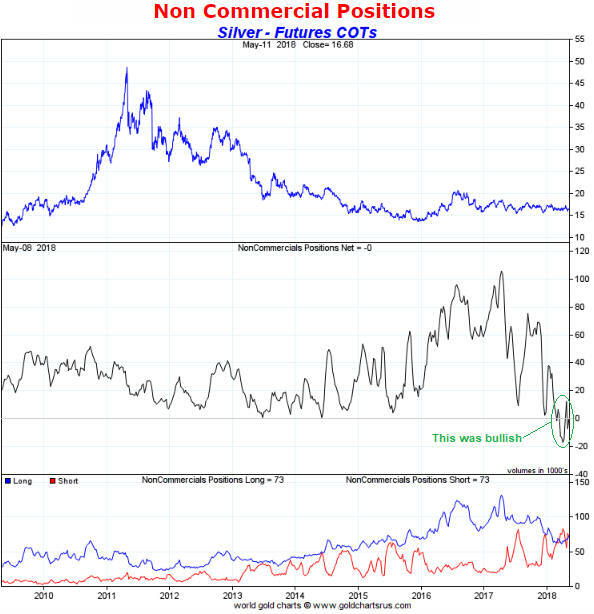 During March and April a number of articles appeared at precious-metals-focused web sites describing the silver market’s Commitments of Traders (COT) situation as extremely bullish. However, this unequivocally bullish interpretation overlooked aspects of the COT data that were bearish for silver. Taking all aspects of the data into consideration, my interpretation at the time (as presented in TSI commentaries) was that silver’s COT situation was neutral and that the setup for a large rally was not yet in place. The enthusiastically-bullish interpretation of silver’s COT situation fixated on the positioning of large speculators in Comex silver futures. As illustrated by the following chart, over the past two months the large specs (called “NonCommercials” on the chart) first went ‘flat’ and then went net-short. This suggested that large specs had become more pessimistic about silver’s prospects than they had been in a very long time, which was clearly a bullish development given the contrary nature of speculative sentiment. The ratio of gold prices versus silver prices is now up to the type of high reading that in the past 2 decades has marked an important low for both gold and silver prices. The value of anything is always and in every case a ratio. Most often the units are expressed as dollars per ounce, dollars per bushel, dollars per share, etc. But expressing the price of an ounce of gold as being equivalent to 80 ounces of silver is perfectly legitimate. We can understand the implications of the dollar price of something being expensive or cheap; it takes a little bit more energy to apply that same principle to such a comparison of the two precious metals’ prices, but it is still valid. A high ratio like this says that gold is expensive relative to silver. But turning that around, it says that silver is cheap relative to gold. And there is information in that cheapness of silver. A reader asked us this week about the personal savings rate. Most people can sense that something is wrong if the rate is in a long-term falling trend, or if it falls too low (whatever level that may be). We argue that falling savings is part of the larger process of capital destruction. And unfortunately, one should expect falling savings rates when there is falling yield purchasing power. The personal savings rate is defined as the ratio of personal saving to disposable personal income. Income excludes capital gains (as it should!) It is a measure of how much is left. This savings will pay for the saver’s own future, and in the meantime it is (presumably) invested to finance the production of new goods and services (and the government’s ever-growing welfare expense). The personal savings rate is in a secular decline. As with other trends we have examined (e.g. marginal productivity of debt), the decline has a high correlation with the falling interest rate. Here is a graph. This post from August 2016 continues to be one of the most popular of the blog back catalogue and with silver now making a move and, of course, Keith Neumeyer coming out with a new round of “Gold to $8,000 and silver to $130” nonsense, it’s worthy of a repeat showing. It’s long and if you want to skip some of the minor matters that’s cool too, the most important point comes at the end about the way in which the supply of silver has changed since the advent of large copper porphyry/skarn mines and the large amount of very cheaply produced silver that comes with them. I’d also previously indicated on this blog that a gold-silver ratio of 80 has historically marked the bottoms for silver. Interestingly, silver moved up 2.5% yesterday while gold was only up 0.2%. Could this be the start of a mean-reversion trend that sees silver move back towards its more typical range of 1-to-65 versus gold? That would imply that silver should be trading at $20.75/oz, based on the a gold price of $1,349. I hope so, given the significant silver exposure in my portfolio. However, I have a hard time believing that silver can have a significant rally without gold’s participation. If gold can break out of its range and trade above $1,370, then I think silver will do very well.